Want to know who’s doing what in Bristol and how everything joins up? There are groups and partnerships and informal networks operating at various levels around the city, many of which are focussed on specific aspects of the food system such as: providing cooking skills in local neighbourhoods; redistributing edible wasted food to community organisations; bringing chefs together to look at ways of improving sustainable food sourcing; helping urban growers cooperate; organising seed swaps, networking and open day events on urban food growing sites; helping food businesses find new food waste collection solutions; connecting up healthy school initiatives with school gardens and school meals; campaigning for the safeguarding of best value agricultural land for food; and promoting independent food businesses. 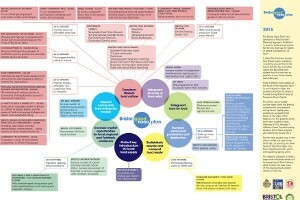 In Bristol, there are three main partnership structures that help to create opportunities to linkup shared interests. In the very centre of these structures are a few individuals that are concerned with strategic integration as well as enabling practical linkages to happen. The world of food is highly complex and these structures are of course imperfect. However, underneath these structures are many different networks that have their own communication mechanisms. 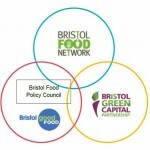 Bristol Food Network is a community interest company (CIC), which emerged from the ‘Bristol Food Links’ project in 2009 as a network of food activists and was formally incorporated in 2014. 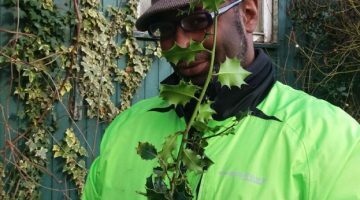 It is a practical delivery organization that aims to support, inform and connect individuals, community projects, organisations and businesses that share a vision to transform Bristol into a sustainable food city. 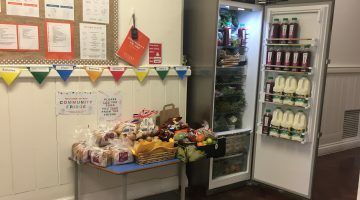 To date it has operated on minimal resources, mainly small grants to deliver specific projects and tasks that support the Bristol Good Food Plan and the work of the Bristol Food Policy Council. 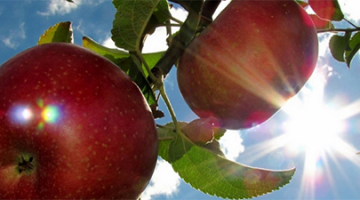 It produces a bi-monthly Bristol local food e-newsletter update and coordinates much of the communication within the wider city food networks including bi-monthly networking sessions. It is also home to the new annual ‘Food Connections’ Festival. Bristol Food Policy Council takes a strategic view in relation to building and embedding a resilient food system for Bristol. 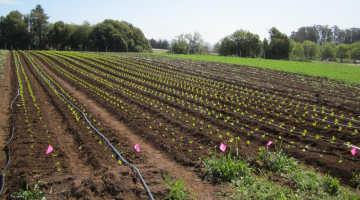 It combines the different elements of the food system (including production, processing, distribution, retail, catering, consumption and waste disposal) with the common objective of achieving a healthier, more sustainable and resilient food system. 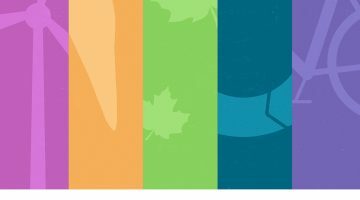 It is made up of a small group of key stakeholders in the food system, including an elected member of Bristol City whose shared aim is to put Good Food on the agenda and keep it there, mainly through their influence and networks. 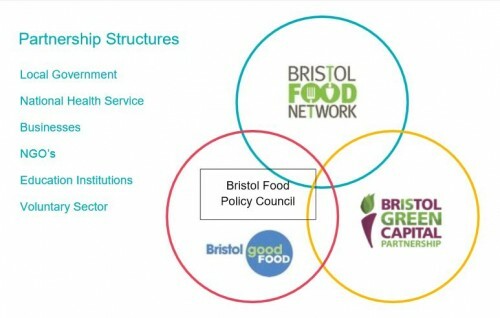 Established in 2011, following a 2010 conference that launched the Who Feeds Bristol Report, its terms of reference and membership were informed by a review of the literature on FPCs in other parts of the world, and by a survey of Bristol Food Network members and other relevant stakeholders. The FPC meets at least four times a year, has a communications subgroup that meets monthly. 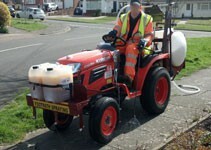 It hosts events, published the Charter and the Good Food Plan, and is developing ways of measuring progress. 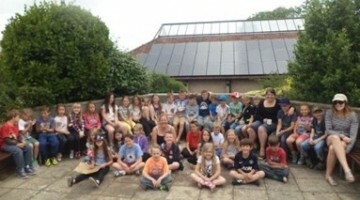 Founded in 2007, and then established in 2014 as an independent community interest company, the Bristol Green Capital Partnership (BGCP) is an independent leadership organisation whose aim is to make Bristol ‘a low carbon city with a high quality of life for all’. In 2015 its focus has been to ensure that its members (over 800) play an active leadership role in the delivery of the Bristol 2015 European Green Capital Programme, and that it becomes a dynamic and fit for purpose independent legacy organisation after 2015. 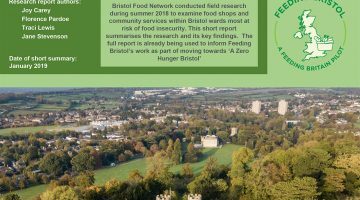 The BGCP has assisted with a number of strategic tasks along the food journey including support in 2010 for the ‘Who Feeds Bristol’ baseline study and in 2015 co- hosting an event to develop a ‘Good Food Action Plan’. 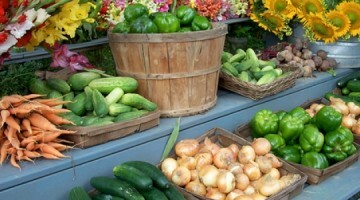 It offers a mechanism for communicating and connecting food at a strategic level with other issues of city sustainability. Bristol Food Producers have made a film! Bristol Food producers worked with the wonderful Blackbark Films to put together a short film talking about what they … Read more Bristol Food Producers have made a film!